Even though we tell ourselves when we go out to dinner at a restaurant to save room for dessert, the plate gets emptier and emptier and we let out a big disappointed sigh when we have to turn away the dessert menu. Is that maybe because you don’t know what you’re missing? Flour tortillas, burritos filled with beans, and endless chips and salsa, we don’t blame you for filling up on these authentic favorites. 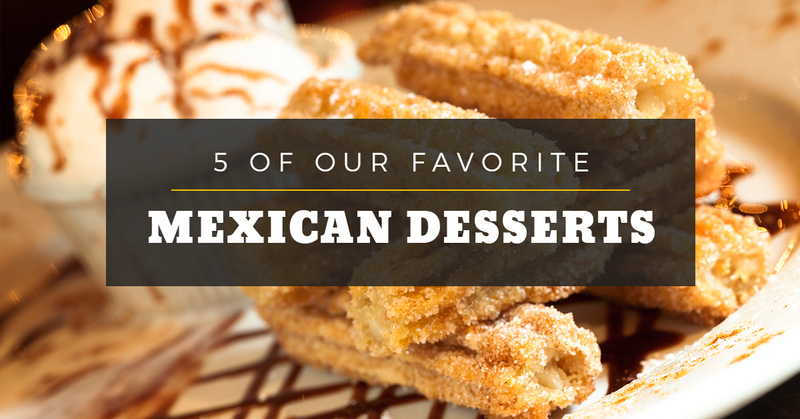 But after reading about these popular Mexican desserts, you might be ordering them up before your meal the next time you visit Tortilla Flats. This fried dessert may originate from the Chinese and Portuguese, eventually making it to the Latin American countries where it is commonly eaten as a dessert, but also as a midday or late night snack. Made from strips of dough, the batter is fried and then sprinkled with cinnamon and sugar or powdered sugar. They can also be served with chocolate, fruit, or caramel sauces. If you really want to indulge your sweet tooth, churros éclairs are the perfect combination of crispy outside and creamy middle. Order up yours con helado (with ice cream). Many people may be surprised to learn that chocolate is a fairly popular ingredient in Mexican food, including mole sauce and even desserts! What makes Mexican chocolate desserts unique, however, is the use of pepper flavors to give the dish a touch of spice and smoke. Chipotle sauce adds a hint of smoke that will bring out the wonderful richness of the chocolate. Chocolate dessert recipes can come in the form of cakes, shakes, doughnuts, or tarts. Although not originally a Mexican dessert (it originated in China), this ball of crispy ice cream is a fun treat for the whole family. Using corn flakes or cookie crumbs to coat the ice cream, the dish is commonly covered with cinnamon, powdered sugar, or even honey. Grab your fork, break open the crisp shell, and have yourself a ball! Mexican desserts can use a variety of tropical fruits in their dishes, including mango, watermelon, honeydew, cantaloupe, and kiwis. Many of these fruity desserts are granitas, a semi-frozen mixture similar to a sorbet or slushy, but nothing beats an avocado popsicle with a hint of lime after a meal of spicy sauces. The cream of the avocado and the citrus tang of the lime are the perfect complement. Though not often found at restaurants, this can be made at home for a summer treat. Maybe the most popular Mexican dessert, flan can be found at a majority of Mexican restaurants. First made in the Roman times, the Spanish were the first to add the recognizable caramel topping. 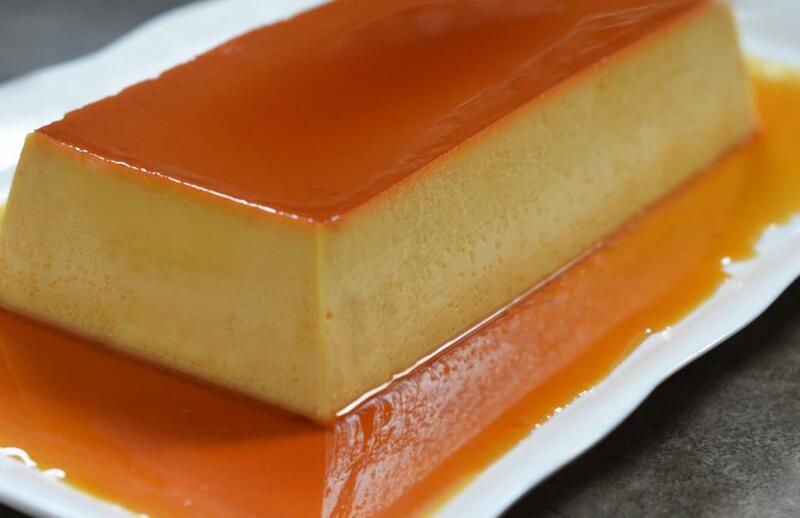 Flan made its way to Latin America in the early 16th century. Cheesecake, crème brûlée, and flan are all similar in recipes, but vary in the amount of eggs, sugar, and cream; but we can all agree that they are a favorite. Although caramel is the most popular flavor, the dessert can also be topped with chocolate, orange, or even pumpkin. Is your mouth watering yet? When you’re looking to satisfy your sweet tooth, there’s nothing better than the unique flavors of these desserts. 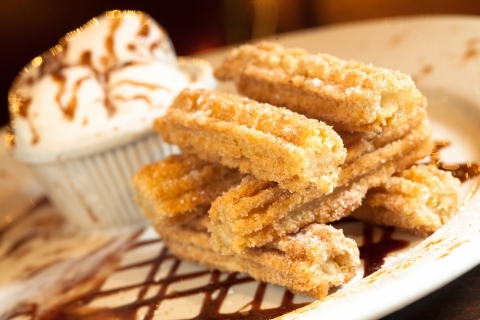 Come explore the menu at our Mexican restaurant in Santa Fe, but make sure to save room for dessert this time!